Topside in Key Largo, Florida! During NEEMO 14, the aquanauts perform saturation diving. Saturation diving is a technique that allows them to avoid the effects of “the bends” so they may work on the ocean floor for their mission. “The bends” is very similar to the experience astronauts have when exiting the space vehicle to perform spacewalks. In these instances, the pressure in the spacesuit is lower than the pressure in the vehicle. In order to safely and effectively prevent “the bends” for saturation diving, dive tables have been developed, to determine the time required for decompression, depending upon the maximum time at a specific depth. “Saturation” refers to the aquanauts’ tissues absorbing the maximum partial pressure of gas possible for a given depth, after being exposed to breathing gas at that pressure for a prolonged time. Saturation diving is important because, once an aquanaut’s tissues become saturated, the length of time required for decompression and safe ascent from the depth of Aquarius will not increase. Mission day 13 was dedicated time for the aquanauts to decompress. Decompression happens as the pressure within Aquarius is slowly brought back to the surface pressure from the operating depth of the Aquarius habitat. This process takes over 17 hours to complete. Once the decompression is completed, the aquanauts are allowed to swim to the surface and return safely home. For more information on Aquarius, saturation diving and decompression, please visit http://aquarius.uncw.edu/. 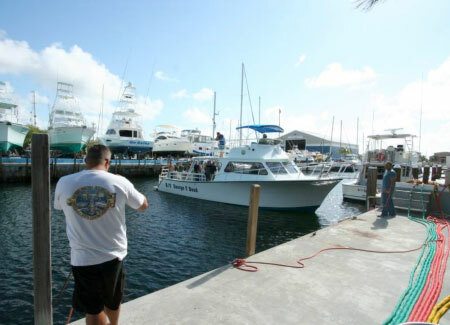 On mission day 14, the crew, happy and healthy, safely made it to the topside boat to return back to the site of Mission Control in Key Largo, after completing all mission objectives. Everyone was glad to see the crew after two weeks.. and they were very glad to be in the sun! The crew and support divers return to the dock in Key Largo where the topside support team was happy to welcome them safely home! It has been such a privilege to work with such an amazing Aquarius crew and topside support and personnel! And thanks to each of you who have been following along with us on this extreme environment mission. Videos, photos and information will continue to be posted to our social media sites, so please stay tuned! If you enjoyed seeing how we continue to prepare for planetary expeditions and are developing technology and operations, keep your eyes out for our next set of analog field tests, which are just around the corner. This blog post is courtesy of the Haughton Mars Project (HMP). The traverse team left Resolute Bay today in the late afternoon after a full day of preparation. They stopped outside of Resolute Bay due to poor visibility, whiteout conditions and a lot of fresh snow. The team is aiming for an early start tomorrow with weather conditions forecast to steadily improve over the next couple days. Although the visibility is poor the team’s spirits are high, and they are looking forward to their next destination goal, the area of Helen’s Haven on the edge of Cornwallis Island. Day 2- Northwest Passage Drive Expedition-2010 continued on the expedition on Cornwallis Island early this morning, driving a short distance before stopping due to poor viability. The team is looking forward to improved visibility conditions and is hoping to reach the east coast of Cornwallis Island tomorrow when conditions improve. Everyone is safe, happy and being patient waiting out the white out conditions. The team managed to continue driving on the expedition late last night when the conditions improved for a bit. They ended up stopping when the visibility became poor, with near white-out conditions. Everyone is doing good; Spirits are high and everyone is enjoying the quiet and beauty of the Arctic while waiting for conditions to improve. The 2010 Northwest Passage Drive expedition team is holding at their present location. All crew members are in good spirits, and are performing maintenance on the vehicle. The expedition is expected to depart again when conditions are stable. The 2010 Northwest Passage Drive Expedition is still on standby, currently in white-out conditions. The weather has not been stable enough for the expedition to cross over the sea ice. In the meantime, the crew is waiting patiently. The crew members are also continuing to perform maintenance on the vehicle. The expedition is on its way again, with the goal of reaching the coast of Cornwallis Island today. The heavy snowfall will slow down the expedition but the crew members are happy to be on the move again. Weather conditions are slowly improving and the crew is very optimistic for the sea-ice crossing. After an evening check-in, the crew reports making some progress today. The Northwest Passage Drive Expedition continues to be on hold due to weather conditions, with large amounts of snowfall that has reduced visibility to less than one mile. The team continues to hold their position and wait until the weather and visibility improve. Northwest Passage 2010 Drive Expedition has stopped for the night. The expedition is pausing six miles short of the Devon Island coast. While pausing, the crew will work on the Moon-1 Humvee and also get some rest. The heavy snowfall has been hard on the vehicle and also tiring for the crew members. The crew is well and looking forward to continuing the expedition tomorrow. Northwest Passage Drive Expedition 2010: The expedition is currently driving over the sea-ice of Wellington Channel. The recent heavy snowfalls are a cause of concern for the expedition, causing the expedition to drive slowly and also making it difficult to find the best path to take. The crew is in good spirits and enjoying the sea-ice traverse before they get back on solid land. The Northwest Passage Drive Expedition is currently a few miles away from the coast of Devon Island. They are resting on solid sea ice with the Moon-1 Humvee. The crew has been performing maintenance on the vehicle which is required due to yesterday’s crossing of the rough sea ice and heavy snowfalls which was hard on the vehicle. Dr. Pascal Lee has sent John Schutt and Jesse Weaver on two snowmobiles to the HMP Research Station (HMPRS) in order to get spare parts for the Mars-1 Humvee. Jesse and John will be staying overnight at HMPRS and will be driving back on their snowmobiles to the Moon-1 Humvee tomorrow, May 15th. The plan is to fix the Moon-1 Humvee and continue on their way. The crew is doing well and busying themselves with route planning for the next day and opportunistic science. Mission day 12 was a continuation of the exploration of the Conch Reef environment surrounding the Aquarius habitat to sample locations discovered during mission day 11. 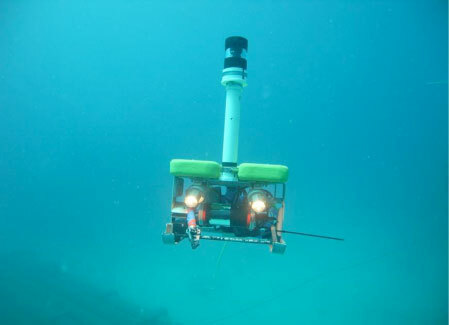 To assist the topside scientists, the ROV (Remotely Operated Vehicle) was operated in “fly” mode which means that it was neutrally buoyant and was better able to track the aquanauts in the maze of coral reef fingers found in the fore-reef zone. The fore-reef zone is the seaward side of the reef where corals that can grow in high-energy environments are found. For more information on the different reef zones, visit Stanford University’s Microdocs project for an overview and short documentary. Up close and personal with the “flying” ROV during mission day 12 exploration of the Conch Reef. 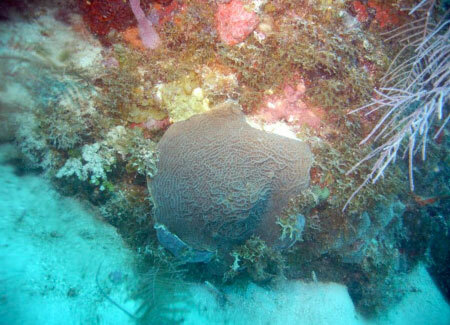 Some of the amazing coral seen during the exploration traverse extravehicular activities (EVAs) during mission day 12. During the NEEMO 14 mission, Project CASPER (Cardiac Adapted Sleep Parameters Electrocardiogram Recorder) completed mission objectives and collected scientific data with regard to a sleep experiment which built upon lessons learned from spaceflight information. The newly gathered data set focused on the Aquarius crew during the NEEMO mission. CASPER monitors the sleep stability of the Aquarius crewmembers by using the electrical activity of the heart. Each crewmember wears CASPER for four nights during the mission. This captured data gives a representation of the changing sleep stability of the crew as the mission progresses. 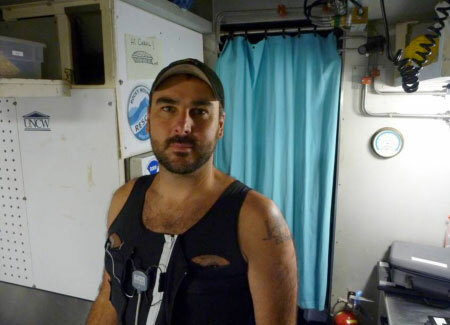 The activity measured the medical data using the LifeShirt which the crew wore during the night. Monitoring the sleep stability of the crew is important both for NEEMO and spaceflight because if the aquanauts suffer sleep disruption it can affect everything from mood, to concentration and memory, which could have a negative a effect on the mission. CASPER offers a portable, practical and repeatable method of monitoring sleep stability in a spaceflight and space analog environment like NEEMO. For more information on Project CASPER, check out the Project CASPER website. Aquarius hab tech, James, wearing the LifeShirt. Mission day 12 outreach activities included a live interview between astronaut Dave Williams (at the Baker Space Institute) and astronaut Chris Hadfield. Also, there was a joint NASA/CSA one-hour press conference with Astronaut Chris Hadfield which was audio streamed live on www.nasa.gov. While these interviews were occurring with the IVA crewmembers, our divers were also supporting an educational event that represented different gravity pulls. For example, one of the aquanauts was weighed to lunar gravity, one was weighed to Martian gravity, and our support diver, Brian, was weighed to a potential asteroid gravity. This awesome demonstration will be uploaded to our YouTube channel at https://www.youtube.com/NASAanalogTV. Mission Day 11 marked the first day of exploration of the Conch Reef environment surrounding the Aquarius habitat. During the extravehicular activities (EVAs), the aquanauts wore the life support mockups and added weights to their diving suits to simulate walking on the lunar surface. During these missions, the crew, along with the ROV (Remotely Operated Vehicle) evaluated science protocols for mapping and sample documentation and collection. The ROV provided situational awareness of the crew’s activities to the aquanauts and the topside science team. The morning EVA crew mapped an area surrounding a coral sand pathway 400 feet long and documented the health and diversity of the coral fingers on either side. The afternoon EVA crew picked up where the morning EVA crew finished and continued to map and characterize Conch Reef. At the end of the day, the crews had identified and located important sampling sites for mission day 12 geoscience exploration activities. 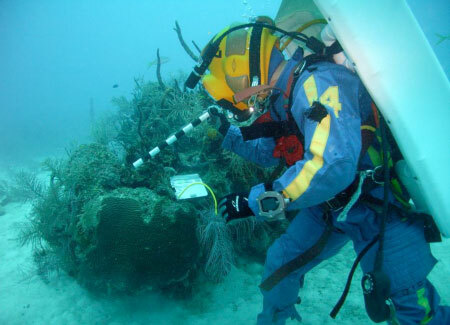 The aquanauts are photo-documenting a coral mound in the Conch Reef surrounding the Aquarius habitat. An aquanaut next to the ROV which allowed the topside science team as well as the IVA crewmembers to watch the exploration. Our education and public outreach efforts have stayed focused on the media today as Tom, Steve, and Chris were interviewed by several journalists. 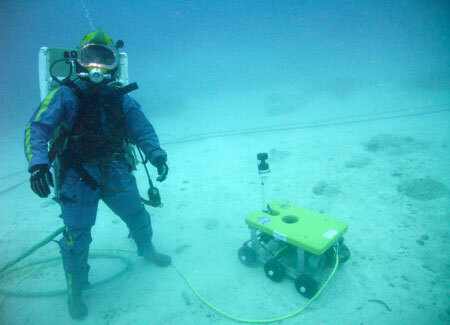 News coverage of NEEMO continues to spread… More articles will be out this week and after the mission as we continue to spread the word about NEEMO 14! During mission day 11, the Alameda High School in Colorado was able to tie into the Aquarius habitat to speak with Tom. They asked very interesting questions about the purpose of the center of gravity (CG) rig, the reason for all of the EVA tasks, how storms affect the habitat, and why the injured crewmember mockup is being used. 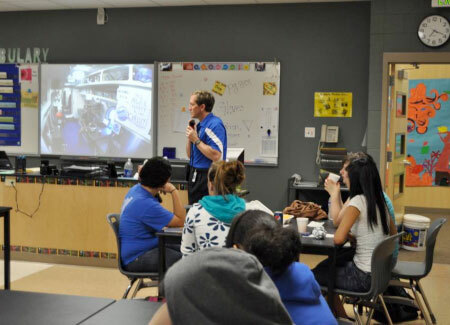 The students from Alameda High School in Colorado were able to call directly to Aquarius and visit with astronaut Tom Marshburn. We also had the opportunity to go with the topside boat to support diving activities! It was cloudy and there was rain just waiting to let loose… but while we had the opportunity to be in the water, the visibility was amazing. We were able to snorkel above the Aquarius and watch as the crew and support divers worked on their EVA tasks. Topside personnel support, Amanda and Leslie, wave hello to the support divers. The 2010 Northwest Passage Drive Expedition is pleased to announce the Moon-1 Humvee Rover’s arrival on the solid land of Devon Island. The crew will be settling down for the night soon, and everyone is happy to be on Devon Island. The 2010 Northwest Passage Drive expedition Moon-1 Humvee Rover is now fixed up and the crew members are on their way, finding the best route to the solid land of Devon Island. They aim to reach the coast tonight, where they will feel more secure resting overnight on solid ground. The Northwest passage Drive Expedition is currently working on the Moon-1 Humvee Rover, with parts brought back from HMPRS by John Schutt and Jesse Weaver. Visibility is still poor but the crew hopes to get to the coast of Devon Island later this evening. Last night at 2220 CDT Mark Carroll was the first to spot a polar bear that was watching the Humvee Rover. The crew at the Moon-1 Humvee rover watched the polar bear for a couple hours until it went far away from the vehicle. The crew was never in any immediate danger but are happy to now have the parts necessary to fix the Moon-1 and continue on their way. The Northwest Passage Drive Expedition 2010 continues to pause on sea ice while poor visibility prevents the return of John Schutt and Jesse Weaver to the Moon-1 Humvee. Weather forecast remains poor for the next couple days but the crew is hoping for the best so the expedition can continue. The 2010 Northwest Passage Drive Expedition has reached Resolute Bay after the 13 day expedition. The crew will start flying south starting tomorrow, and are all happy to be returning home. From left to right: Mark Carroll, John W. Schutt, Jean-Christophe Jeauffre, Jesse Weaver, Dr Pascal Lee (Expedition Leader), and Kira Lorber.